(soda biscuit) and other kinds of biscuits. It mainly consists of flour mixer, soft biscuit forming machine, hard biscuit forming machine, syrup sprayer, salt and sugar sprinkler, tunnel oven, oil sprayer, 180°Swerving machine, cooling conveyor, stacking machine, packing table and packing machine. 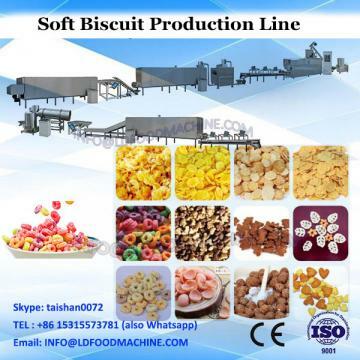 Certainly all these machines can be combined flexible based on different plant layout requirement, different capacity and biscuit styles in that to make it achieve an ideal effect. Laminator: It is characterized by adopting the cutting laminated layer method, and the number of the laminated layers are 6 to 7 layers. 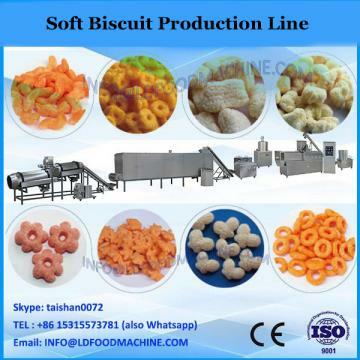 And it’s suitable for making soda biscuit or high-grade cracker, hard biscuits. Hard Biscuit Forming Machine: It consists of a four roller mechanism, a double-roller (printing and cutting) forming mechanism and an excessive material recycling mechanism. Soft Biscuit Forming Machine: It is used to form soft biscuits ,after being pre-rolled by combination sheeter ,the dough run into the rotary moulder for forming step. It is adjustable between feeding roller and moulder roller, so that ensure the weight of each biscuit is same. Tunnel Oven: It has three heating types: Gas, electric heating, according to customers’s local energy conditions, they can choose one type which is most suitable for their local energy conditions. Shenghua Group Hebei Saiheng Food Processing Equipment Co.,Ltd is an industrial company with rich experience, specializing in the manufacturing of wafer biscuit line, soft/hard biscuit line, bake oven and relate parts small machine. easy to operate, high yield, good shape, the cut potato chips French fries surface smooth, uniform thickness and thickness can be adjusted freely. The new energy-saving frying machine has electric heating, coal heating and other forms. SAIHENG Full automatic soft and hard biscuit production line uses imported high-quality stainless steel materials, exquisite workmanship, sturdiness and durability.